(There's also -- not very visible in the photo -- a little hanger at the top for putting up on a wall). These are actually frames which can also be used for other purposes -- but why should I encourage you to replace my work with something else? Measurements: 5 x 5 inches. Price: $10 each. 0309_Single-handedly, I have fought my way into this hopeless mess! 0367_My final decision is: maybe. 0398_All I ask is a chance to prove that money can't make me happy. 0519_I feel much better, now that I've given up hope. 0571_One possible reason why things aren't going according to plan is that there never was a plan. 0595_Please don't tell me to relax - it's only my tension that's holding me together. 0711_I hope I get what I want before I stop wanting it. 0729_There has been an alarming increase in the number of things I know nothing about. 0759_I don't have any solution, but I certainly admire the problem. 0872_Sometimes it seems life is just a long series of interruptions. 1194_By doing just a little every day, I can gradually let the task completely overwhelm me. 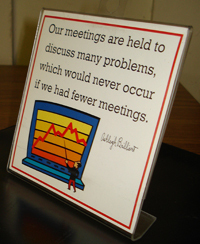 1248_Our meetings are held to discuss many problems which would never arise if we held fewer meetings. 1250_A terrible thing has happened -- I've lost my will to suffer. 1520_I try to take one day at a time, but sometimes several days attack me at once. 1960_My life is already complicated enough, without trying to introduce organization into it. 5919_Time goes fast, when you're eating chocolate. 6178_Don't believe everything you think. 6235_Take my advice, and, when things go wrong, you'll at least have somebody to blame. 6370_Some miracles come so slowly, you don't even realize they're happening. 6448_Believing in good things doesn't make them true, but gives you a happier life in the meantime. 6502_Some of my best living has been done when I really should have been doing something else. 6930_Wrinkles are easily explained, because your life naturally shows more creases, as it unfolds. 7423_I always did what seemed best at the time -- that's how I got into this terrible situation.